As most whiskey fans already know, the father and son team of Corky and Carson Taylor revived the Peerless brand that their ancestor, Henry Kraver, started in 1889 in Henderson, Kentucky. I hadn’t been able to visit Peerless—now located just west of Louisville’s downtown business district—until this past spring, and I quickly realized that I’ve been missing out. Currently, all distillery operations and aging are in the same building, but as we saw, the aging warehouse area was full to the brim. Peerless has two rickhouses nearing completion in neighboring Henry County, both using a single-story design with a capacity of 5,200 barrels each, that are expected to be ready this summer. 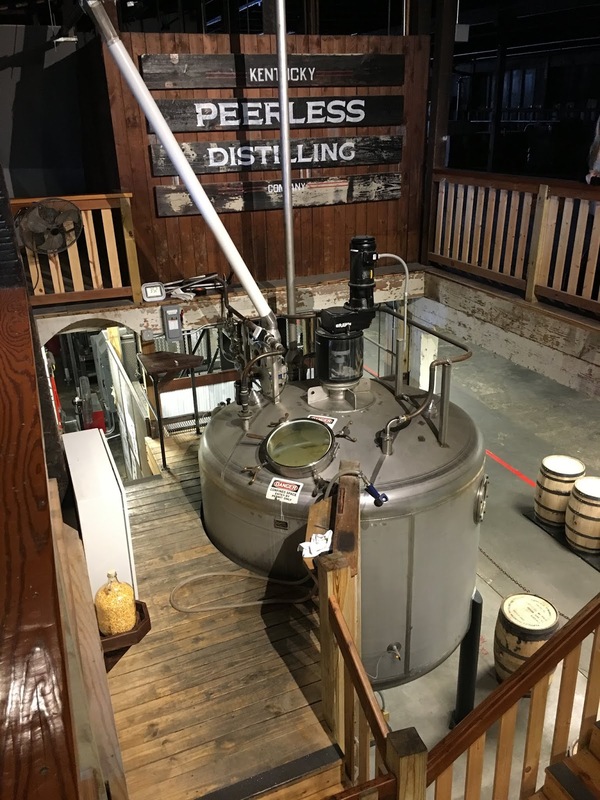 Part of what differentiates Peerless from almost all other distilleries is that it uses the sweet mash process. 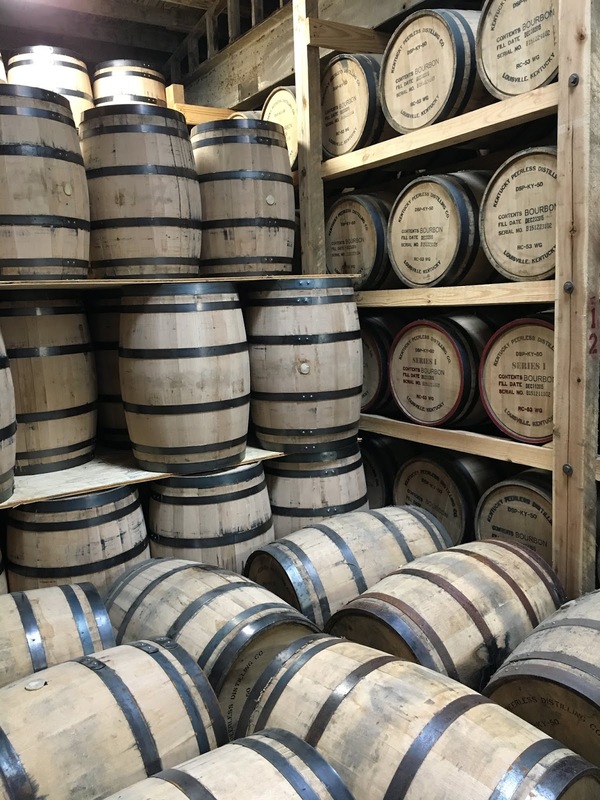 The sour mash process—which is often credited to Dr. James Crow as one of the innovations he perfected around the 1830’s—uses backset from a previous fermentation run to jumpstart the next batch. Sweet mash, however, involves steam sanitizing the fermentation tubs after each run and using only fresh yeast and grain. Caleb Kilburn, the Head Distiller, is now officially one of my favorite people in the whiskey world. He’s knowledgeable beyond his years, he has tremendous skill and gives straight answers while being personable. After getting deep into the weeds about sweet mash, proof off the still and the doubler, barreling proof (107! ), fermentation periods, and more, Caleb took us through a tasting of the award-winning two-year small batch Rye and three single barrels that highlight what he called the three flavor pillars of Peerless: oak & pepper, fruits & floral, and caramel & vanilla. All are non-chill filtered and bottled at barrel strength. My favorite was the single barrel with the sweet profile, which I bought at the gift shop. My only complaint is that our tour guide, John, incorrectly stated that the old Peerless was one of the “lucky six distilleries to have a license during prohibition to sell medicinal whiskey.” This line also used to be part of the Peerless story that the company was mistaken about, but I thought that it had been sufficiently corrected by folks like Maggie Kimberl (see Maggie’s article here) by early 2017. The six (of ten authorized) medicinal licenses were issued to the A. Ph. Stitzel Distillery, the American Medicinal Spirits Company (via Old Overholt), Brown-Forman, Frankfort Distilling Company (acquired by the Paul Jones Company in 1922), Glenmore Distillery, and Schenley Distillers. Peerless was not one of those six licensees. And just like the other shuttered distilleries, Peerless stocks were consolidated into government warehouses and sold as medicinal whiskey. The banner news here is that Corky and Carson had the love and the drive to revive Peerless, so why not focus on that without the licensee distraction? Medium amber; darker and creamier than I expected. Sweet caramel and vanilla galore along with fresh-baked iced cinnamon rolls. There aren’t any obvious youthful aromas and it has more bourbon aroma than what I would expect from a rye whiskey. Carmel and vanilla as advertised, along with deeper flavors like oak and tobacco, light rye, and baking spice, delivered with a creamy mouthfeel. It’s missing any pronounced pepper and spicier rye, but that’s precisely why this single barrel was selected—to showcase a distinctly sweet profile. Medium finish with noticeable grain coming through while retaining a sweet, satisfying warmth. I really enjoyed this Rye, and I don’t qualify it as “great for a two-year Rye.” I never would have been able to guess its age. 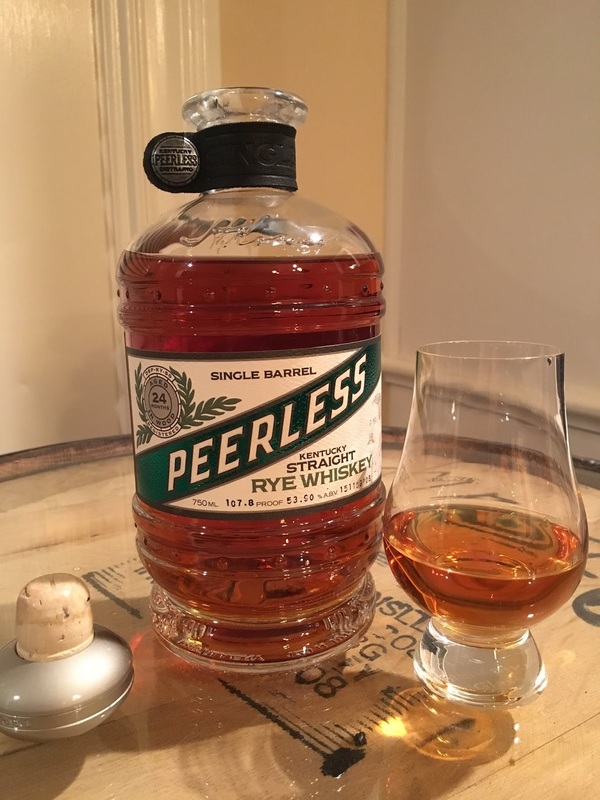 While Peerless is proof that young whiskeys can be remarkable, rest assured this won’t be confused for a whiskey with a dozen or more years in the barrel. They’ll definitely be different, and I might like them for different reasons, but more age doesn’t always mean better whiskey—just like a higher price doesn’t always mean better whiskey, which is where you have to be careful with Peerless. The price is going to stop many purchasers in their tracks, but that’s probably the only thing preventing it from being out of stock. I bet the majority of craft distilleries in US use a sweet mash process, so hardly unique. And $120 for a 2 year Rye??? does it come with a stock share of the company?